Correctly Walker would have hanged with Ryan for the murder he committed in a public toilet whilst on the run. Sympathy with violent criminals encourages future violence. Sadly Australian culture is criminal by nature. 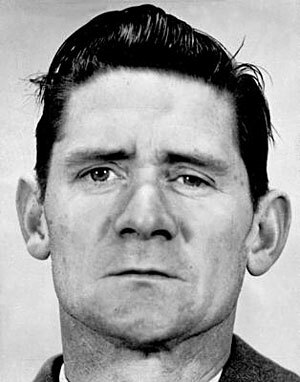 Rumor has it; the Wikipedia article on Ronald Ryan is being secretely controlled by relatives of prison guards Robert Paterson (who fired the shot) and George Hodson (the deceased). Ronald Ryan was executed on systemic flaws in the justice system, including using eyewitness accounts as the sole primary evidence, the mishandling of forensic evidence, false or forced confessions and political pressure for a hanging, all contributed to this miscarriage of justice. On the day of the Pentrige Prison escape, prison officer Paterson admitted to firing his rifle, signed a police statement, and later testified at trial that he fired ONE SINGLE SHOT in the direction of Ryan, Walker and prison officer Hodson. All persons heard this ONE SINGLE SHOT fired. None of the hundreds of people surrounding the escape scene heard two shots fired. The medical autopsy report of Hodson’s fatal injury, which was verified by ballistic expert evidence at trial indicated the fatal ONE SINGLE SHOT was fired from a distance, at an elevated position, in a downward trajectory angle. Anyone with an IQ below ‘normal’ can easily figure out who shot Hodson. dont worry the ears still live on, maybe the hat will fit me?? The Victoria Police museum webpage shows a photo of a felt fedora hat that belonged to Ronald Ryan. Forget the bloody hat. Show the public the photo of the rifle that ‘allegedly’ fired the fatal shot. Or is the rifle still in hiding due to lack of forensic evidence? An interesting website and additional info on the corrupt Ronald Ryan case and execution. There is rumor around town that new evidence has emerged. The fatal bullet found. Hey, wait a sec, am I getting this right, that ronald ryan was hanged with no scientific evidence of proof that he commited murder? ok, so how was it proved he did, besides the four out of fourteen witnesses who said they saw him do it? what did the other ten witnesses see? I mean, was there any forensic tests? I confessed once, to something I didn’t do because I was threatened my family would be harmed if I didn’t confess. I’m with you Linda that it’s a weird thing to do from a jury that convicted ronald ryan. The story at the time was that the jury had been pressured by two others but later realized they weren’t sure about convicting him so they made up some excuse about that they didn’t want the rope and added said they would never have convicted ronald ryan if they’d known he would be hung. But the jury would have known that capital punishment was the mandatory sentence so that don’t add up. I remember everything about the case was so corrupt right from the start and then an undecided jury. But they hung him anyway to cover up rotten stuff. Apparently, most of the jury members that convicted Ronald Ryan of murder later made several pleas to State politicians not to execute Ryan. Most unusual request by jury. I can’t recall anything like that happening anywhere around the world. Why would jury members come forth and make requests not to hang a man they had convicted of murder only months earlier. It just doesn’t make any sense at all unless the jury were not sure of Ryan’s guilt afterall. According to Ronald Ryan’s attorney Philip Opas, a recent book by Mike Richards ‘The Hanged Man’ is just flat-out wrong and fabricated in so many places. Some information appears to support Richards point of view on the Ryan case. Other material contains an obvious bias towards Richards personal opinion and belief. Opas pointed out that the contents of Richards book has intentionally been slanted toward that bias and there’s also the fact that factual information, which does not support Richards personal views, have deliberately been omitted from the book. Richards told the ABC on February 6, 2007 that he believed Ronald Ryan was guilty as he confessed to a number of people. For the record, allegations of confessions (denied by Ryan) are not proof of guilt under Australian law. Richards is not a lawyer and was not involved in the Ryan case. Richards was simply one of many thousands of protesters against Ronald Ryan’s hanging. Thanks for this article. It is balanced and in contrast to Wikipedia’s article (long history of disputes) on Ronald Ryan where over time the referenced facts are continually and deliberately deleted and replaced with inaccurate unproven allegations towards certain persons viewpoints. Ronald Ryan was convicted, sentenced to death and subsequently hanged, based solely on unsigned and untaped allegations of “hearsay” said to have been made by Ryan to police. There was no sicientific evidence whatsoever. Ryan’s rifle was never examined by forensic experts. Mysteriously, vital pieces of evidence that would have cleared Ryan of murder went missing. All fourteen eyewitnesses for the prosecution testified different accounts of what they saw – there were serious wide-spread inconsistencies. Only one shot was heard by all persons. Ballistic experts testified the fatal shot was fired from a distance at an elevated position in a downward trajectory angle. A prison officer admitted and testified he fired one single shot from a distance, standing on a low prison wall. If Ryan had also fired a shot at least one of the many dozens of people at the scene of the crime would have heard two shots fired. No person heard two shots. These are the facts !! !